See a Specialist To Get an Accurate Lewy Body Dementia Diagnosis. Dementia with Lewy Bodies is only understood by very few in the medical profession. It is difficult to diagnose, and only highly knowledgeable doctors and specialists know much about Dementia with Lewy Bodies. Even though it’s known to be the second most common dementia after Alzheimer’s, very few people are diagnosed accurately and quickly. This makes a difference to the progression. The only diagnosis with 100% accuracy is at autopsy. However, reasonable certainty can be obtained by diagnosis while still in early stages. Knowing that you are dealing with an “overwhelming likelihood” of Lewy Bodies is enough to get things moving in the right direction. The Internet Is Not A Diagnostic Instrument: Don’t Diagnose Yourself. With the staggering volume of information available on the internet, it’s easy to become convinced that you have any number of conditions. Being your own internet doctor can benefit you by keeping you informed, but is best when you know for certain what you are dealing with. I firmly believe that the best way to get an accurate diagnosis is from a skilled professional, and you can reap many benefits from working with a good one. Once you know what you’re dealing with, you can start on the path to reduce the negative impacts by making changes to medications, exercise, community support and your own plans for the future. Many individual characteristics of Lewy Body Dementia are shared by a variety of other conditions. Symptoms are shared by Parkinson’s Disease, Alzheimer’s Disease, Schizophrenia, Frontal Temporal Dementia, Vascular Dementia, and others. It is easy to be convinced it is this one, or that one, depending on what behaviours might, perhaps, be most dramatic at any given time. It isn’t always the dramatic aspects that define the condition, it is often ones you might not think necessarily connect, such as poor balance, or acting out dreams while asleep. From my own experience, the condition changes significantly during its progress, and having that connection with a good specialist will help you build a network to navigate the changes that occur. Be Assertive. 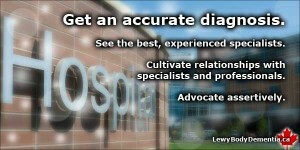 Get a Referral To A Neurologist or Specialist. If you feel that things are just “not right”, and even suspect it might be dementia, then you will need the support of your primary doctor. They are the gatekeeper to the world of specialists in most cases. We needed to have a referral from one doctor to see a specialist in another discipline. This can be frustrating. Cultivate a positive relationship with your doctor as much as possible, because you will likely need to “lean on” her for quite a bit as time goes on and the condition progresses. The sooner the diagnosis is confirmed, the sooner you can get on with mitigating its damage. This is critical. When the possible diagnosis sounds more like an upsetting or frightening sentence, procrastination is a natural reaction to the dawning of realization that something might, just might, be very wrong. Don’t delay. Go To The Biggest Institution You Can Reach. A hospital with higher volumes of patients will have more likely seen your particular set of symptoms than one with low volumes. Bigger cities tend to have these higher volume hospitals, and more targeted specialists. I think it is well worth travelling a distance to get the best care, but keep in mind that you may have to go rather frequently depending on how things progress. It is also possible that once you’ve seen the key specialist, that almost everything else will be possible from a location closer to home. Balance the need for specialization and expertise with viability of reaching it. Learn everything you can before you meet with specialists so you can know what they’re talking about, and what questions to ask. I have found them to accept a surprising volume of questioning, when offered respectfully, and from legitimate research and the genuine desire to do the best possible for my loved one. There are incredible resources here, and on many other websites. You may be fortunate enough to find local assistance, since support options vary by jurisdiction. Advocate assertively on behalf of your loved one. Typically busy medical professionals will usually have very short appointments. Make sure that you make the most of the time. Be informed, prepare notes, and bring them with you so you don’t forget anything, and get to the critical points as quickly as possible so you can cover everything efficiently. notes from hospitals and other specialists. Knowing the dates, or times of day an unusual behaviour began, and its duration and potential triggers are useful details to provide your specialists. Journalling may also have the untended consequence of bringing a little relief to you: you may begin to notice that many things are temporary, and just part of the fluctuations in the wild ride of Dementia with Lewy Bodies. Your advocacy will go a long way to proper diagnosis and treatment. This will make the best of a bad situation, and is well worth the extra effort. Our Story: Out of Pocket Expense Was Best Investment Ever. The family doctor of my loved one repeatedly said, “it’s fine, we’re all getting older,” when confronted with unusual behaviours or things we thought were out of the ordinary. My very proactive father finally decided his wife needed something different, and paid out of his pocket for a full range of examinations at the Toronto branch of the Cleveland Clinic. This came at great cost. But he has often said that it was the best investment he ever made. I agree. She was rigourously tested on many aspects of her physical and cognitive abilities in 2008, when she was 78. Along with the more subtle ailments they found that had not been commented on by her other doctors, one was described as a “condition that could lead to Parkinson’s or Alzheimer’s Disease.” This led us into a scientific study program, and put us in touch with two specialists whom I consider to be at the very top of the field in Canada: one in Geriatric Psychiatry, another in Neurology and motion disorders, and the diagnosis of Dementia with Lewy Bodies. I believe we would never have had this diagnosis had we not gone to the Cleveland Clinic. I do not endorse them above any other reputable group, but I am thankful that they got us on the right path, one which I do not believe we would’ve found had we continued with only our primary practitioner. If you’ve got your diagnosis, or are on your way towards one, that is just one step. The most important steps will be what you do with the diagnosis. Be strong. Be resourceful, tenacious, patient, adaptable and ingenious. You will need these strengths and more, and the best way to nurture them is to have support in this journey. Get the most you can with friends, family and community, but also make sure you check out other sources of support. There is help out there. You can listen to the story above by clicking the red “play button” below. You have an excellent website for LBD. Very informative! I went a long time before things started to occur that told me this was not an age related problem. The best diagnosis of LBD was a home visit by a GNP with extensive experience with dementia who spent two hours in our house observing my wife. Thank you, Daine. Although the diagnosis is so crushing, knowing what you’re dealing with is critical, and it’s exceptional that you persevered to get the accurate diagnosis. So many people are undiagnosed, to great peril. Strength to you! My wife was recently diagnosed with Lewy Body Dementia at the University of Pennsylvania Hospital. Hi Lawrence. Sorry for the diagnosis, it’s a tough road. But knowing what the diagnosis is will help your wife get the very best possible treatment, and make things the best they can be. The University of Pennsylvania is a great diagnostic and treatment centre. You’re fortunate to have it within reach. You’re doing a good thing.